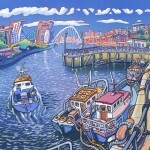 Many thanks for the delivery of the order of the framed John Coatsworth print to Newcastle yesterday. I'm most grateful for the excellent timing - as a birthday present - and also for the excellent framing of the print. 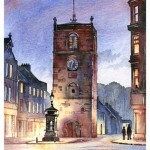 We were very pleased with it.I hope to make some future orders from Bridekirk, as the print makes such a lovely gift. The Twilight Tyne print by Paul Wright has now arrived safely in Houston and my Father is delighted to have something to remind him of home. Thank you for all your help, I will certainly be coming back for more of your fabulous prints. Thank you for latest delivery of prints they are even better than I imagined. I am going to need a bigger house soon! Thank you also for your personal service it made everything happen perfectly on time.